We are the leading Manufacturer & Exporter of Automatic Packing Machineries in weigh-metric technologies. 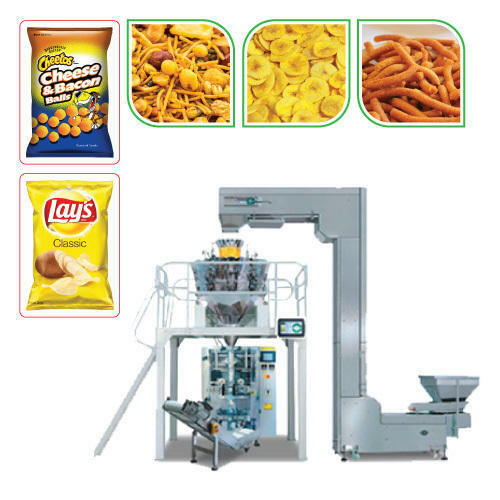 Our machine is Auto Weighing, Filling, nitrogen flushing, Sealing, Coding, Batch Cutting, Cutting , counting all in one machine .One more special features is that in our machine you can produce the packets ranging from 10gms to 1000gms. Automatic Pouch packing machine Multi-head weigher is developed for precise and high-speed quantitative weighing packaging system. Linear Weigher is suitable for weighing material of small quantity of grain with good uniformity, such as Chips, Mixture, Namkeens, Nuts, Snacks items, Grocery items, Dry & Processed Foods, Fresh Foods. Fox example, Snack Foods, Seeds (Pulses), Coffee, (granules/beans), Tea, Sugar, Grated Cheese, Bakery Products, Candies & Confectionery, Rice, Nuts & Dried Fruits, Spices, small Pasta pieces, Pet Food (pellets) etc..Also available in single, two, three & four head. English display, operation is simple. PLC computer system, function is more stable, for adjustment any parameters no need to stop the machine. It can produce 10 packets at a time in chain and simple to change the variety. Temperature independent control system, precision get to±1°C. Horizontal, vertical temperature control, suitable for various complex film, PE film packing material. Bag–making, sealing, packing, print date in one operation. Program can be freely adjusted according to the production condition. Chips, Mixture, Namkeens, Nuts, Snacks items, Grocery items, Dry & Processed Foods, Fresh Foods. For example:Snack Foods, Seeds (Pulses), Coffee, (granules/beans), Tea, Sugar, Grated Cheese, Bakery Products, Candies & Confectionery, Rice, Nuts & Dried Fruits, Spices, small Pasta pieces, Pet Food (pellets) etc.